In his example the system will harvest water off a 350sqm roof. Water is treated to potable standard and simply replaces the municipal water when there is rainwater in the tanks. It also contains a switch-over backup system if the municipal supply is interrupted or if the rainwater tanks are empty. 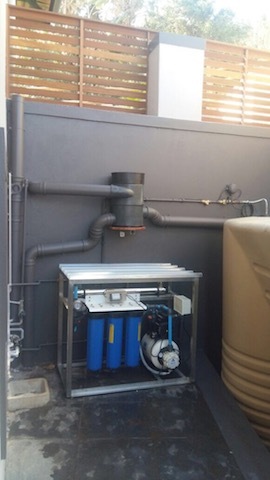 Four round 5000l interconnected rainwater tanks or two 10000 liter low profile tanks Generally the building is designed to place the tanks in a basement or deck covered area which is at the lowest point in the building or property . Integrated gutter and down-pipes that direct all the water from the roof via a network of pipes and gutters to a single 160mm header pipe. The header pipe direct the water to a primary vortex filter mounted near the tanks. One WFF 150 vortex filter . All the water from the roof gutters will be directed to the WISY. The WISY WFF150 primary vortex filter is self-cleaning and screens out any organic material greater than 280 microns. It can manage rainwater falling on roof surfaces of up to 500sqm. It ensures that the rainwater tank is kept clean with minimal sludge buildup in the tank, thus improving the water quality and reducing the cleaning frequency of the tank (you would only have to clean the tank once every 5 years). One multi syphon overflow with vermin and insect protection. You want to protect the water quality in your tank. 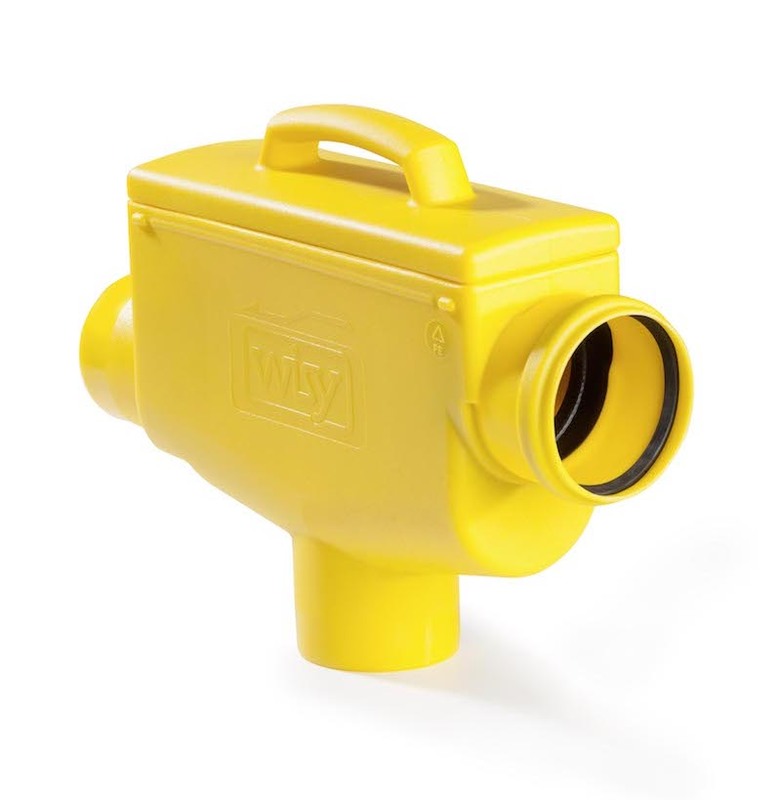 The multi syphon overflow prevent any insect or vermin from getting into the rainwater tanks - especially where the overflow is connected directly to the underground stormwater pipe. One floating suction connected to the suction of the pump. The floating suction draws water from just under the water surface ensuring that the old water in the tank is used first - keeping water fresh at all times in the tank. Sturdy 304 stainless steel frame. Grundfos multistage horizontal centrifugal pump. The pump is a high quality unit that runs very efficiently and very quietly. It is as loud as an air conditioner when running. The tank increases the longevity of the pump and reduces energy consumption by reducing the number of pump starts required. The pressure tank uses an EPDM diaphragm instead of a bladder. Global Water Solutions PumpWave pump controller. The pump controller is designed to work in conjunction with the pressure tank. The controller protects the pump from dry running. 20" 20 micron pleated cartridge filter. The filter removes all suspended particulates larger than 20 microns from the water. 20" 1 micron pleated cartridge filter. The filter removes all suspended particulates larger than 1 microns from the water. Activated Carbon and KDF55 cartridge filter. The filter treats the water for any color and odor that might be present, resulting in fresher tasting water. The UV light kills 99.9% of all microbes that might be present in the water, resulting in water that is safe for human consumption. Once municipal top up solenoid valve and float switch system. By setting the a minimum water level in the tanks an electrical solenoid valve will always top an minimum amount of water to the tank. 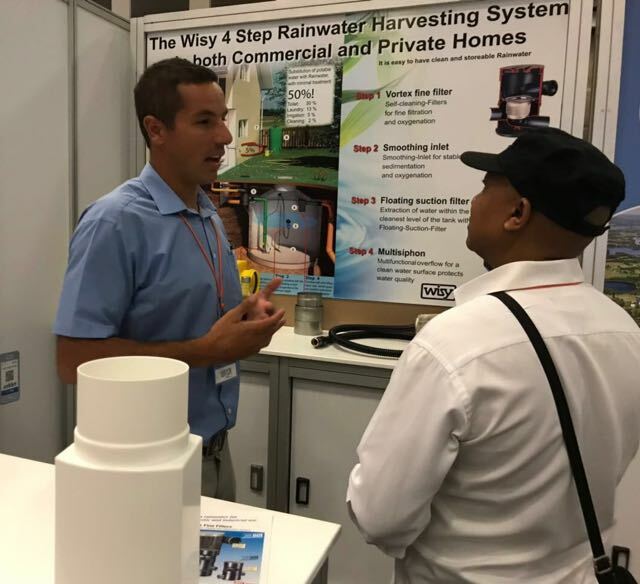 Thus if there is no rainwater or if the tanks are starting to empty, the system will automatically add some water to ensure you always have potable standard water in the building. When it rains and the tanks fill up it will stop and the system will only use rainwater. One municipal switch-over system and bypass valve system. If anything goes wrong or if the system need to be maintained you can bypass it and simply use municipal water for a while. 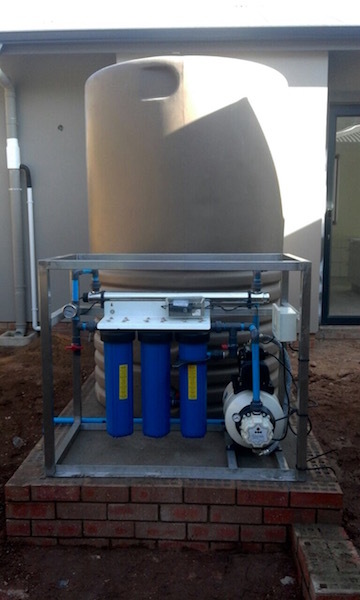 This is the ultimate “green” water solution for a new building and adds significant value to the property for re-sale. The system is developed and designed at conceptual stage - reducing cost and focusing on maximizing rainwater recovery. When you design a system like this it delivers the greatest return on your capital investment. All the roof surface of the building is being used to harvest rainwater as efficiently as possible. There are no dual plumbing and piping system. The purified municipal water simply replace the municipal water. Installation time is about 7-10 days. These system can be expensive but it has a good return on investment. It is best designed by the Engineers and Architect involved in the building design.